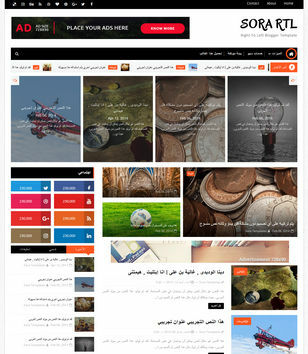 A complete list of blogger template for arabic language. We have a huge collection of RTL blogger templates. Now publish your content in your local language with zero bugs and errors. Every widgets and functions are converted into RTL, to support arbic in best way possible. If your blog or website is targeted towards certain group of visitors than you are at a right place because you can create a website that is conventional and convenience of your end users, by using these multi lingual RTL Arabic blogger templates. With these blogger templates that support’s RTL, you can create websites in Arabic, Hebrew, Farsi/Persian, Urdu or any such RTL language. Or create a multilingual website with language options. If you blog in these languages then creating a website in your local language is definitely the best idea. Subscribe Here to get new Blogger Template Arabic when publishing.